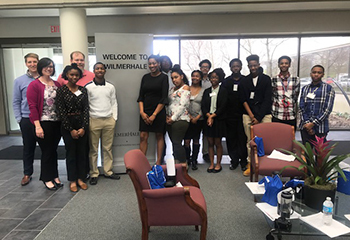 For the second consecutive year, WilmerHale's Dayton office hosted 13 high school students from Dayton Early College Academy (DECA) for a job shadow. The day was organized to help students learn about the legal industry and careers necessary for business success. Students had the opportunity to hear from WilmerHale professionals focused on finance, information technology and new business/conflicts. In addition to department breakout sessions, a portion of the day was spent mock interviewing to provide students with feedback and tips on developing and improving their interview skills. The job shadow is a part of the two-year philanthropic partnership between the firm and DECA. Through the partnership, DECA receives $25,000 annually, in-kind and event volunteer support, and other career mentorship opportunities, including mock trial practices and reading and editing assistance for all grade levels. After more than a dozen years, the DECA has built a K-12 school district, focused on instilling within students a passion not only for attending college, but graduating with the perseverance of career readiness. What sets DECA apart from other schools are the high expectations set for students. From community service and jobs shadows, to extensive “Gateways” that prepare and apply students into college courses, DECA provides opportunities for students to gain the experience and exposure they need to be successful in college and beyond. As a public charter, DECA depends on private support to close the gap between public funding and the cost of educating students. Visit www.daytonearlycollege.org for more information.